Posted July 16, 2012 by Sage & filed under Race Reports, Recovery, Training and Racing. A few years ago, I heard Michael Caine say that early in his acting career, he was to play a drunk man onstage. His director corrected his performance by pointing out that a drunk person is trying to appear sober, so his acting should be to play sober, not drunk. This tidbit comes to mind in the days just after a long, hard race. I try to minimize the waddling I do with postrace soreness, but I know I look like something is a little off. I’m walking like someone who’s hurt but trying not to let it show. 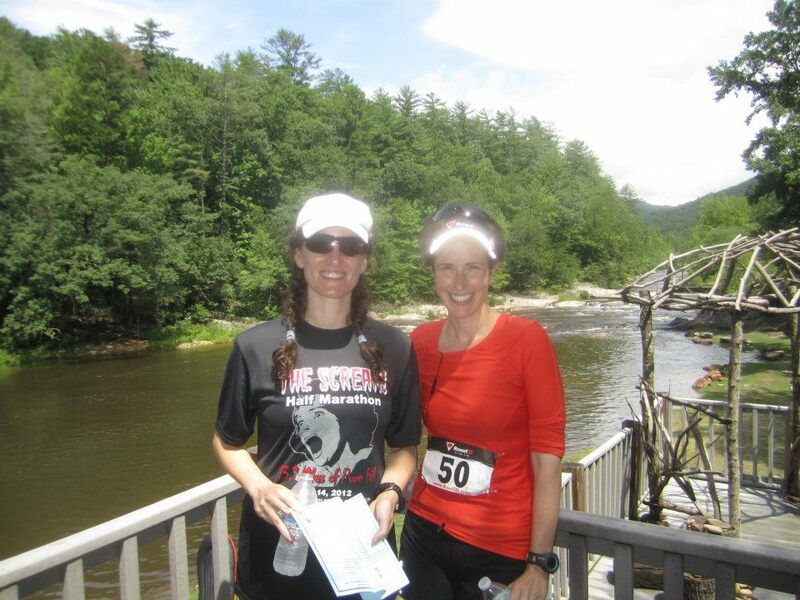 The source of this soreness was a fun downhill half marathon in the Pisgah Forest, called, aptly, the Scream. Check out the incredible elevation graph below. After being so tentative in my descent of Mount Mitchell in February, it felt wonderful to barrel downhill with abandon. To sound like an overly philosophical yoga teacher, the course taught me how to run it. The further along I got, and the steeper the grade became, the more my confidence grew. It was a practice of surrender. Why brake when it was going to hurt later no matter what? I gave in more and more and went faster and faster. My quads are paying the price now, along with some bonus soreness in my traps from lifting my arms to control my descent on the steepest grades. The race finished at a campground bisected by a stream, which quickly filled up with eager ice bathers. I got to enjoy the fun experience with my friend and student Kortni—here we are all aglow (and full of burritos!) postrace.